We all know that retro-rock enthusiast Jack White has a major penchant for vinyl, as his Third Man Records label has given us unique slabs of wax that include secret tracks hidden on the inner label and Triple Decker Records. Now, he's turned his love of vinyl into a product that even digital music listeners can enjoy: an iPhone case made out of a seven-inch record. A description on the Third Man website notes that the back of each case was made with a real seven-inch. 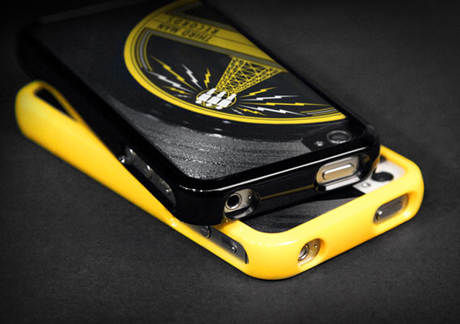 These were designed to fit an iPhone 4 or 4S. To make this even cooler, you can actually switch out which vinyl record serves as the back of your case if you buy the additional iPhone inserts. You could either use white vinyl from the White Stripes' "Candy Cane Children," black vinyl from the Raconteurs' "Steady as She Goes," or yellow vinyl from the Dead Weather's "Treat Me Like Your Mother." That's a whole lot of Jack White history right there. Together, these products cost $50 (it's $30 for the case, $20 for the inserts). To sweeten the deal, the frame itself is available in white, yellow or black. Orders will ship on December 12 in the hopes that they will arrive before Christmas. Get yours here. The funniest part about all this is that, even though Jack is making a product to appeal to the iPhone-using masses, it still kind of feels like he's making fun of them. The product description for the case promises to "[protect] the controls, edges and screen of your precious iPhone." Can't you just hear the sarcasm?